The heart’s desire / personality bridge number is like a bridge between what you really are and what others think you are. The heart’s desire number is also known as the soul urge number whereas the personality number is called the inner dreams number in numerology. This bridge number helps to make others understand you much better. It also improves our relationships. This number thus is like a bridge between how you think you are projecting yourself and the way people see you. (Take an Arudha Lagna reading to know how the world perceives you). This numerology reading will help make your relationships better and let others know how you are in reality. 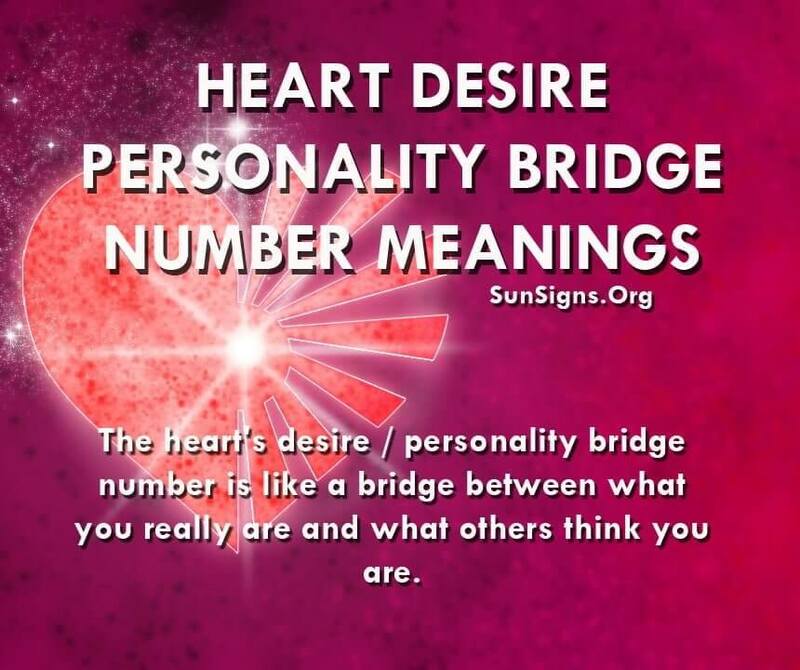 Find your heart’s desire / personality bridge number using the numerology calculator given below. People will feel comfortable in your company and seek your association. You are in charge of your life but sometimes things may not work out according to your wishes but you should not lose heart and keep your cool. This is very lucky number and you will make people feel comfortable around you. Sometimes your life may go haywire if your Life Path number or your Expression numbers is also identical to your Heart Desire number and your Personality number. But you don’t need to worry much as these things will change for the better with time. With the 1 heart’s desire / personality bridge number, you need to be more confident and clear about your goals and desires of life. You should be more open in expressing your feelings and thoughts to others. You will have to try hard to change the course of things. You should try to know your greatest strengths and potentials. Be clear about your inner self and express yourself clearly. Express your thoughts and feelings openly and in a straightforward manner. People with soul’s urge number 1 will have to try hard to change things. You need to take charge more often. People with bridge number 2 need to show patience in their work and in their relationships. You need to handle situations with utmost care. Your relationship with others will be fruitful if you show more sensitivity to their needs and desires. It’s time for you to gain from the harmonious and happy relationships that you share with others. (Get a free numerology compatibility reading). You should use your potential to influence others with your gentle nature. Don’t try to quicken things and proceed in a slow and steady fashion. You should let it take time. Try to be sensitive to the wants and expectations of others. Try to maintain good relations with others. People with this bridge number get easily frustrated by failures. You need to have faith in yourself and face life’s difficult situations with courage. You have a creative and artistic streak in yourself and will express your talents in these fields. You should not lose your heart if you are hurt. Rather communicate your feelings to your close ones. You should develop faith in yourself. You will shine in the areas of arts, music, writing etc. It’s time to enjoy your life now. People with bridge 4 should try to avoid confusion and make an effort to get a clear idea about things. You should be systematic and methodical in whatever you do. You need to explore nature and appreciate its beauty. This will give you a sense of inner calm and peace. Don’t be confused or indecisive. You should try to be more reliable, punctual and follow certain systematic methods. You should learn to love your surroundings. You should try to know yourself and the meaning of life. Try to venture into new projects. You should give up your attitude of being dependent on others since this is the time to be independent and go on your own will. You should trust your own abilities and go ahead on the strength of your gut feeling. Risks taken at this time will be successful. Flexibility and adaptability is seriously needed. Try to be more adventurous and unconventional. You need to take risks for reaching the peak of success. Try to maintain a balance between the boundaries of self-sacrifice and self-behavior. Try to be more consistent. You should value and strive for congenial and friendly relations with your family and friends. Healthy personal relationships will be rewarding. You should trust people and seek their companionship. You need to express your creativity to get a sense of satisfaction. (Take the parent child compatibility by name test). You need to spend some good and happy moments with your family. Be more expressive and show how much you love your family, friends and relations. You need to trust and love people. It’s time to be responsible. By expressing your creativity, a feeling of calmness should come over you. Spending some time in solitude would be rewarding enough for you. Through this, you will gain vast knowledge and get a sense of satisfaction. You would like to delve into matters to find some unknown answers. You may need to spend more time alone and think about matters that are spiritual in nature. People with this bridge numerology number, will seek and gain knowledge and wisdom through your research. Your mind is brimming with ideas. You will have a lot of questions in your mind about different matters. You need to be thoughtful. Self-reflection and isolation hold the secrets of happiness for you. People with heart’s desire / personality bridge number 8 should avoid taking short cuts. You will not be successful with this method. You will have to do things in a methodical and organized manner. You need to overcome your laid-back attitude and work hard to be successful in whatever you do. In this time you can get financial and monetary success if you make the most of your resources. You need to value the fact that happiness comes from financial security. You will have to let things flow in a normal manner. (Learn how to budget and save money). You should cultivate a strong sense of ambition. You will need to work hard to achieve your goals. Do not be impractical and try to imbibe in yourself that financial stability provides security. This bridge number is from 0 to 8. There is no number 9.